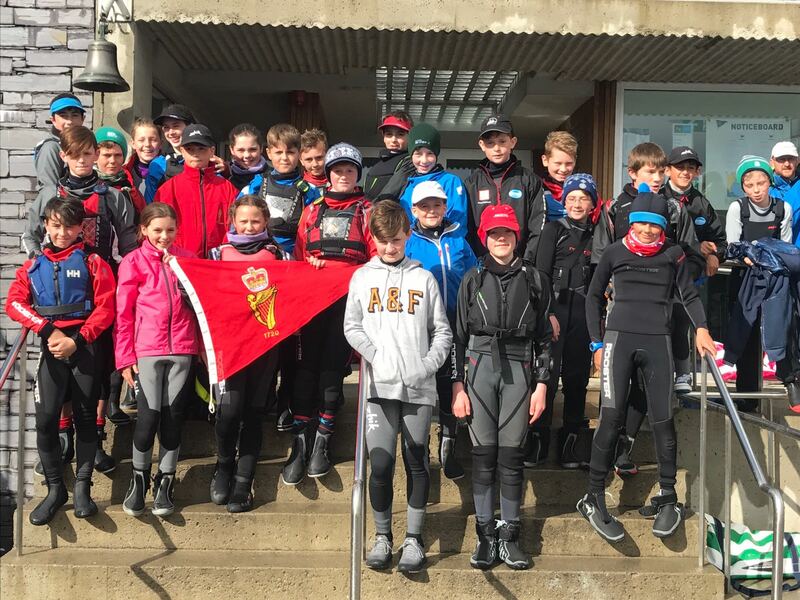 It was a weekend of two halves – mirror-flat water with little breeze in grey, damp conditions on Saturday, followed by a steady 15-20kts in quite challenging seas and sunshine on Sunday. 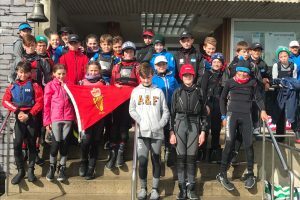 Over 140 optimists went to sea over the course of the weekend, of which 42 sailed under the Royal Cork burgee – I’m not sure we got all of them in the photograph! However, all our sailors did well, with plenty of silverware returning to the Royal Cork once again. Proving a master of the big seas was Rory O’Sullivan, whose three bullets on Sunday made him a worthy Senior champion. Royal Cork boats took 3 of the top 5 places, with Harry Twomey going well in the light on Saturday finishing 4th overall, and Justin Lucas starting and ending well (1, 2) but regretting his OCS in Race 3. We had a further 2 sailors in the top 10, Harry Pritchard in 7th and James Dwyer Matthews in 10th. Next up was Michael Crosbie in 13th, and Killian O’Regan, also catching an OCS, in 14th. Cillian Foster completed our top 20 sailors in 20th, only one place but a good 10 points ahead of Jamie Venner in 21st. Jamie was chased hard by Richard McSweeney who went well in the heavy seas on Sunday, finishing 22nd. Eoin Horgan and Kate Horgan were part of a three-way tie, breaking in favour of Eoin in 28th and Kate in 29th, with Patrick Bruen just one place back. Ciara Burns took 4th Silver/36th overall. Eva Spillane and Cian McDonagh did themselves proud in very trying conditions, only a point separating them in 44th and 45th. Local girl Anna Carroll finished 51st, and Darragh Collins 56th in one of the largest and most competitive fleets at Senior level in quite a while. In Junior fleet, we had 4 of the top 10 positions filled. Simon Pritchard narrowly missed out on 5th on countback. Stephen Cunnane was one point and one place behind him, and Anna Keal had a great outing in all conditions, with a 5th on Saturday and a 4th on Sunday giving her a 9th overall. Lucy Bateman took home the Silver title in 10th overall. Again, another two of our sailors had to be peeled apart as Emmet Lucas and Alana Twomey shared 68 points, with Emmet taking 19th on tiebreak to leave Alana in 20th. George O’Keeffe in 24th and Ryan Nolan in 25th also did very well in the challenging conditions off the Bulman, which left many sailors looking a bit green around the gills! Having a solid outing too was James Murphy in 27th. Those heavier conditions on Sunday did for a number of our sailors – Ben O’Shaughnessy, George Pritchard and David McSweeney all counting RETs or DNCs to finish 32, 35 and 38 respectively. Regatta fleet did not get afloat on Saturday, despite the day calming down significantly. On Sunday, Sam Coveney led the Royal Cork charge over 4 races, finishing 7th. Rian Collins came in 9th, and Rowan MacSweeney 14th. Craig O’Neill (17), John Nevile (18) and Ellen Bruen (19) got the remaining scores on the doors for Royal Cork. Eoghan O’Connor, Harry Moynan, Andrew O’Neill, Charlie Venner, Liam Duggan and Maeve Crosbie all fell victim to the gusty breeze. Their day will come! A huge thank you to all parents who helped out. Particular thanks from KYC to those who provided and/or crewed ribs for safety – and a thank you from the class to KYC for hosting the event. A shout out too for those who helped with the new trailer – loading, moving and unloading, as well as hauling and towing ribs – it’s what makes the Optimist class what it is.